Want to have a fun get-together without a lot of work? Have an art party! 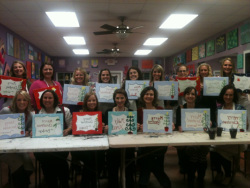 Birthday parties, Ladies Night Out groups, Scouting Groups (great way to earn the painting patch! ), church groups, bridal & baby showers, civic groups, Red Hat Society (ask about our Red Hat painting! ), family night, and more! Call 706-776-1022 or email today to schedule your event! 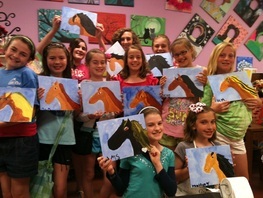 Basic Party is $80 for the first 8 painters (including Birthday Child) and $8 each additional artist. Birthday child can choose between painting on 8x10 canvas or jewelry making. Budding Artist Party is $135 for the first 8 painters (including Birthday Child) then $14 each additional- the artists paint on a larger 11x14 canvas. Each Kid's Party includes the instructed activity, supplies, and use of the party area. Each party is booked in a 2 hour block (the first hour is for the activity, the 2nd hour is for gift giving, cake, etc.). There is a $25 deposit due at time of reservation. Please view/download the party guide for available party times and optional add-ons. Adult art parties are great way to get together with friends & do something different! You are welcome to bring refreshments as you desire, however, alcoholic beverages are NOT permitted at parties where minors are in attendance. Monday-Thurs. 5pm-8pm: Min. Req'd- 8 painters. $250 for first 8 painters + $25 each additional artist. 16x20 canvas. We will do a 2 hour painting then have the extra time for your gift giving etc. Great for Baby Showers & Bridal Parties! Available Friday & Saturday Nights, and Sunday Afternoons.